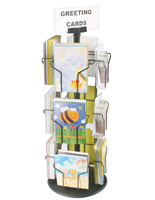 These Post Card Stands for Countertop Make Merchandise Accessible to Customers. 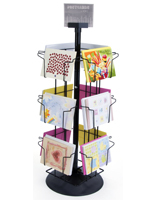 Each of These Wire Rack Systems in Glossy Black Showcase Your Wares. 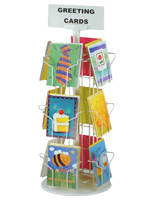 Buy These Post Card Stands and Boost Sales! Comes with customizable sign holder. Features 24 pockets for showcasing merchandise. Comes in glossy black powder finish. 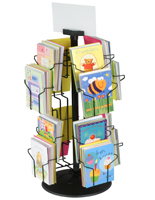 These post card stands for a countertop are designed for crowded counters where things are tight. These storage units, wire shelves, should be placed near a cash register or other prominent area in a store. 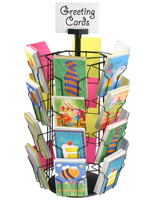 These post card stands, also known as wire rack systems, easily grab attention in areas of high foot traffic. 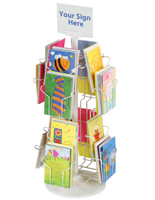 These wire shelves units have (6) individual pockets that accommodate 4"w x 6"h cards and are (4) sided. That's a (24) pocket wire shelves unit to show your goods! 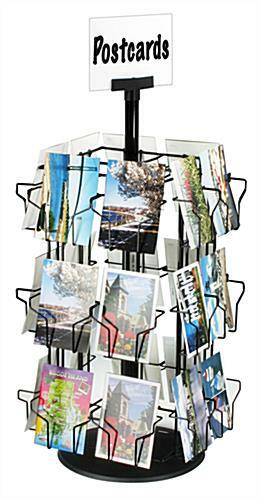 These fixtures, post cards stand are sold with a sign clip on the top for merchants to insert their own printed advertisements. These wire rack systems, wire baskets holders, are spinning for ease of use for customers, on a molded plastic base. 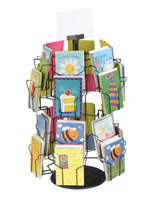 These post card stands are steel wire with a black glossy paint finish. 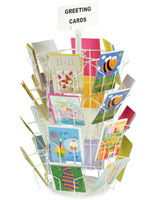 These marketing tools, card storage units, ship unassembled. But it takes just a minute to assemble without any tools! 4.5" x 3.3" x 1.5"